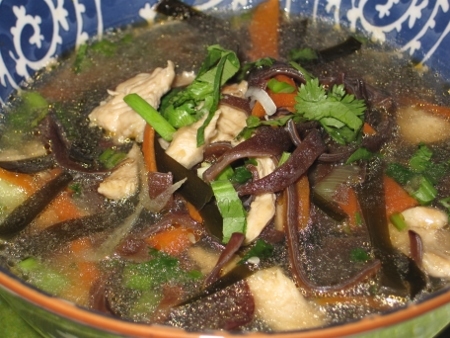 Kelp is high in natural iodine, which is essential to the proper function of the thyroid. A healthy thyroid is necessary in controlling growth, energy and metabolism in our body and supporting our immune system to fight infections. Iodine is used for curing goiter, the swelling of the thyroid gland. Kelp is high in fiber and non-fatty acids and is known to lower blood pressure and cholesterol. Kelp is extremely alkaline which keeps our body’s pH balanced to prevent cancer growth. Kelp is also high in lignans, phytochemicals found in sea vegetables, which can limit the amount of cancer cells released into the blood stream and limit tumor growth. Kelp can reduce inflammation in joints and bones which helps to alleviate pain, especially for people suffering from arthritis. Kelp is high in iron, calcium and magnesium. It is a good source of vitamins and minerals for women to promote healthy bones and helps to promote better sleep through menopause. Kelp is low in sugar and high in fiber. It helps to slow down the metabolism of sugar therefore reducing sugar spikes commonly found in diabetics after eating. Kelp can also be used as a diuretic, which helps the body to shed water that it might retain. Kelp is abundantly available in many coastal countries around the world but may not be commonly eaten especially in the western diet. A daily dose of kelp may just be the ticket to get your body in good health and to lose a few pounds. 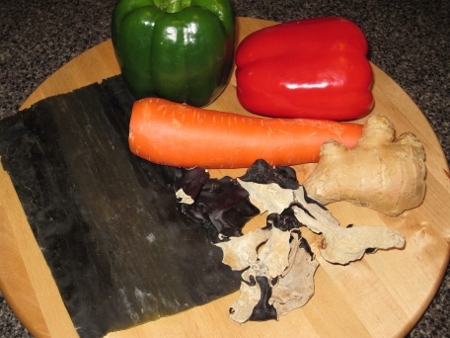 Here are a couple of recipe suggestions for you to increase your regular intake of kelp. But it you are high in iron, or suffering from hyperthyroidism, or you are pregnant or are breast feeding, you should stay away from kelp because too much of a good thing can be harmful. 1. Soak kelp with plenty of water to rehydrate fully and rinse a few times. 2. Put kelp in boiling water to boil for about 10 minutes or to desired softness. Retrieve, rinse with cold water and strain. 3. 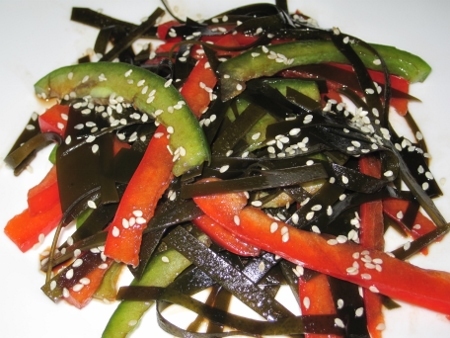 Cut kelp into thin strips (matchstick or julienne cut) and then season with vinegar, soy sauce and sesame oil to taste. 4. Cut optional ingredients into similar strips and mix with kelp to serve. Make a larger batch of kelp at a time, season it and keep it in the fridge to serve up to a week. Only mix in other optional ingredients when it is time to serve for freshness. Lowers blood pressure and cholesterol, prevents tumor growth, treats swollen thyroid gland, promotes blood and clears blood stagnation, promotes yin and prevents heart disease. 1. Soak kelp and wood-ear mushroom until fully rehydrated. Put in boiling water to cook for 5 minutes, retrieve and rinse. 2. Peel carrot and wash.
3. Wash meat and strain. 4. Cut all ingredients into thin strips using julienne or matchstick cut. 5. Season meat with adequate amount of sugar, salt, pepper, garlic powder, cooking wine, potato starch and sesame oil and put aside. 6. Bring adequate amount of water (or broth) in a pot to boil, add all ingredients except meat to cook for about 20 minutes on medium boil. Remove foam if any. 7. Add meat to cook for a few minutes more. 8. Add scallion, coriander and seasoning to taste and serve.